The brown ale is one of my favorite styles, partially because it’s fairly loosely defined. They’re usually low to medium gravity, and can be toasty, sweet, nutty, or even heavily hopped or soured. I’ve found most of them to be friendly, approachable, and simply relaxing to drink. Jason has asked for his brew to be a brown, and I’m excited to take shot at formulating my own recipe this time around. It will hopefully be a step up from my first brew. I’d also be curious to try this recipe with Wyeast 1187 or 1450, which I’ve read positive things about. This time around I simply didn’t have time for a starter. I’m omitting crystal malt, which is a definite deviation from what’s typical of this style, but I think with this highly flocculant yeast there will be plenty of residual sweetness and body left after fermentation (and there’s good reason to be skeptical about the utility of crystal malts in that capacity anyway). Additionally I’ll have decreased hop utilization due to my partial boil, so I think the malt will remain dominant in the finished beer. My projected OG is around 1.05 (only 1.015 before the DME addition). I mashed with 5 quarts of strike water heated to 166 degrees F, which settled to my target with the addition of the grain. I covered the kettle and wrapped it in towels. After about 20 minutes, the mash had cooled to about 150 degrees F, so I heated up a 1.5 quarts of water (to an unknown, temperature – presumably around 180 degrees F) and added it, which brought me back up a couple degrees. At the end of the hour long mash, I performed my first iodine test for starch conversion. The iodine test is conducted simply by mixing a couple drops of wort with a couple drops of iodine on a water dish. If there is some residual starch in your wort, then the iodine turns purple. Fortunately, I used iodophor (basically tincture of iodine) to sanitize my equipment, so I had plenty of iodine on hand. It does not matter if the iodine is diluted, so a properly mixed sanitizing solution of iodophor is fine. Braukaiser has some nice images of iodine tests throughout a mash. The iodine test showed that my starch was fully converted into sugar, and the wort did taste slightly sweet. The preboil SG was 1.011, which means my efficiency must have been way low (below 50%) or I’m not properly calculating gravities for my partial boil. I decided to put in all four pounds of DME (which I wasn’t sure would be necessary originally). My prediction was that this should get me an OG of around 1.046 once I topped off the batch to 5 gallons. I completed the boil, chilled the wort in an ice water bath, sanitized my gear, and rehydrated the S-04 in a half cup of water at 90 degrees F. After 15 minutes of hydrating I added about a cup of wort to the yeast slurry, and within minutes the yeast formed a mini-krausen. I pitched the yeast at 64 degrees F. The OG of the wort was 1.053, which I just don’t understand. Assuming my calculations were carried out correctly and that my hydrometer works correctly (other than the fact that it reads tap water at 60 degrees F as 1.002), the calculator I use to plan recipes may just underestimate the dissolved solids in my DME. It’s also possible that the trub that is suspended in my samples is throwing off my readings, but I don’t see why the trub should have any effect from my understanding of buoyancy. Around four and a half hours later a krausen was starting to spread over the surface of the fermenter, and one day later fermentation is chugging away. 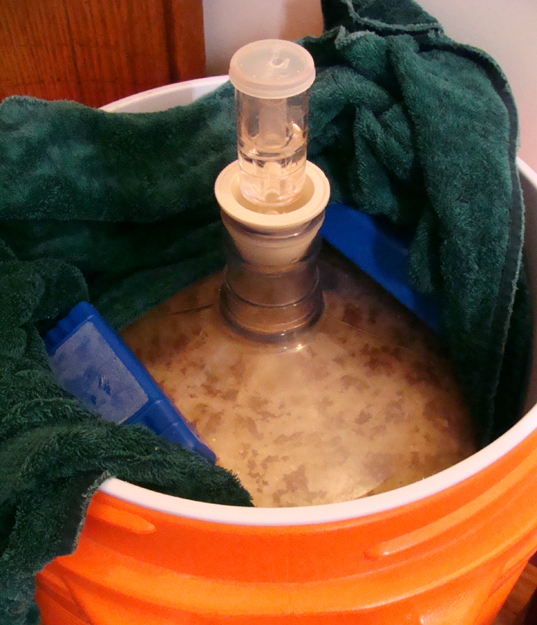 I’m trying to hold temperatures low by keeping the carboy in my mash tun cooler. I’ll be cycling in new water and new ice packs every so often to maintain the temperature. From data I’ve seen from a larger water bath indicates that there is very little temperature difference between the fermenter and the bath (unlike a fermenter in air), so for my small water bath the temperature of difference between the two should be negligible. Just from the first night of fermentation, my guess is that swapping out some amount of water and the ice packs every 12 hours will probably be sufficient for this batch. Update (6/4/2013): Fermentation stopped showing any visible signs around 5/30. SG is now down to 1.013, and I plan to bottle it soon. Flavor of gravity sample is quite clean and devoid of any apparent esters or phenolics. It’s not entirely pleasing to me, seeming a little more woody than nutty. It has slight tannic/astringent quality that reminds me of the failed stout. Nose is very malt forward, can definitely pick up the chocolate malt and some of the lighter toasted malts. The mouthfeel is good while drinking, even without carbonation, but it does hang on to the palate for quite awhile afterward. In all likelihood this is all a symptom of the beer being quite young (as well as warm and uncarbonated). I’ll be bottling it soon and am excited to see how it is in three weeks after carbonating. This entry was posted in beer, brew day, recipes and tagged brown ale, fermentation, fermentation chiller, narrative, temperature, temperature control on May 26, 2013 by Dylan Bargteil.